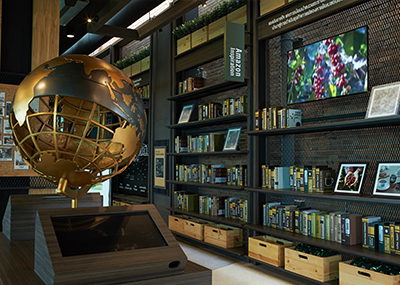 Amazon Treasure is the zone providing information about coffee, including world coffee cultivations and different coffee cultures, and exhibiting the stories of Café Amazon brand and our awards of success. 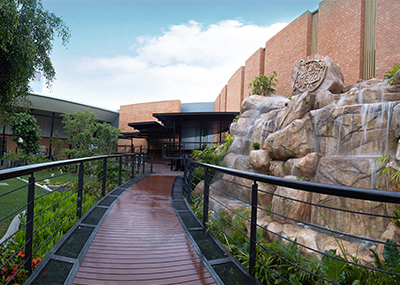 Discovery Land in the form of Green Oasis where happiness and freshness among the nature is created for visitors. 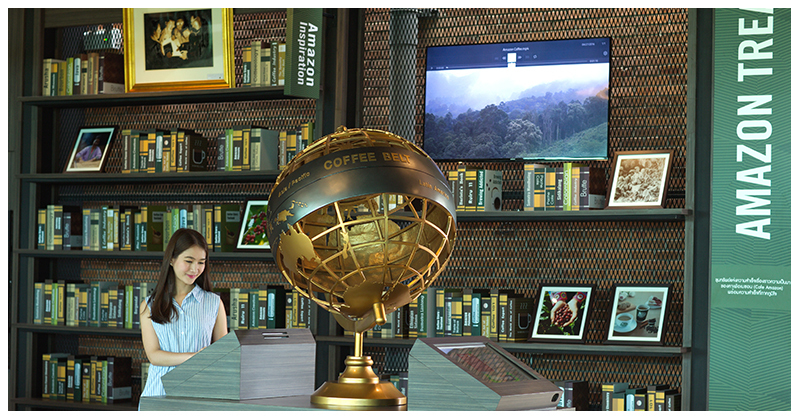 In addition, visitors can experience fun and discover interesting knowledge on coffee. Coffee Woodhouse or coffee bean haven is the zone for relaxing or recreation activities. The design is inspired from coffee bean shape. Coffee Trail is the route showing how we select coffee bean from farms, passing through different processes, in order to yield high quality coffee beans to our Roasting Plant. 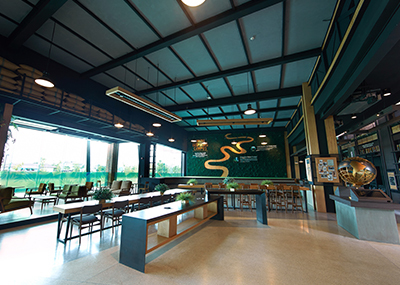 Amazon Creation is the zone that exhibits Café Amazon’s meticulous coffee roasting production. Coffeeology is the zone about the science of coffee grinding and brewing in order to obtain perfect aroma and taste. There are real coffee trees forvisitors to see and learn. 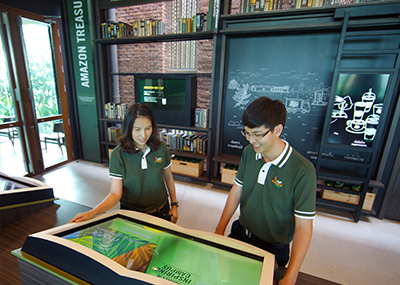 Amazon Journey Theater is the final zone of the learning exhibition. 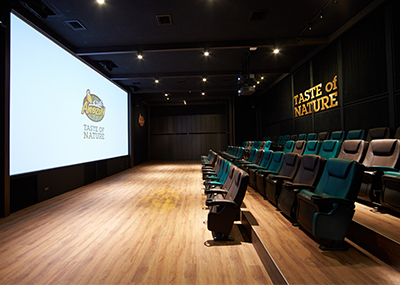 It is the 3D theater which will take everyone to experience Taste of Amazon. 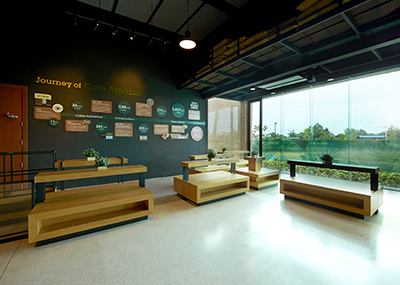 Visitors can watch the secret behind each cup of Café Amazon coffee. At AICA, we also provide Barista Training to owners or managers of Café Amazon coffee shop. We offer both theoretical and practical training courses, as well as effective shop management training courses for shops that are already operated. This is to ensure that all branches of Café Amazon provide services based on international standards and deliver high quality coffee to consumers. The last section of AICA is the Café Amazon Roasting Plant. 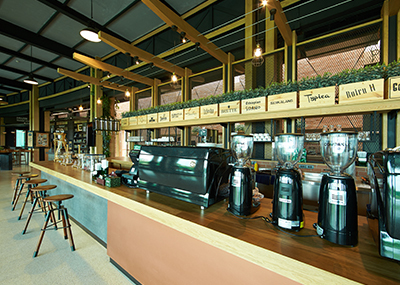 It was established to ensure that Thai people can have tasty coffee with affordable price based on Café Amazon standards. All procedures are focused from selecting and buying quality coffee beans, roasting methods based on excellent standards, to brewing of beverages for customers. Roasting Plant of Café Amazon is certified according to standard system of Good Manufacturing Practice: GMP Codex and its capacity is 2,700 tons a year.